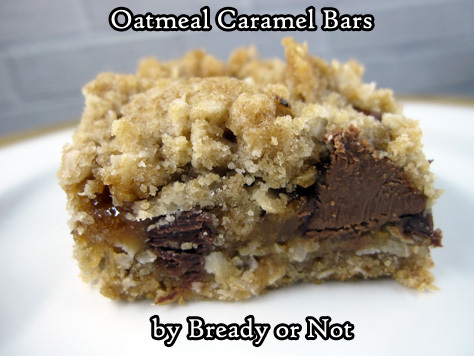 I’d like to thank my past self for setting me up to re-discover this Oatmeal Caramel Bars recipe. When I was home last Thanksgiving, my mom gave me a stack of her old recipes and food magazines to go through. A lot of the material dated to the 1970s and ’80s and went straight in the recycle pile. Mixed in with everything else, though, I found some little food magazines I had bought back in 1999 as I looked toward getting married. One of them highlighted favorite recipes from the Pillsbury Bake-Off. This recipe, originally titled Oatmeal Carmelitas, dated from the 1960s. I knew I had to make it. 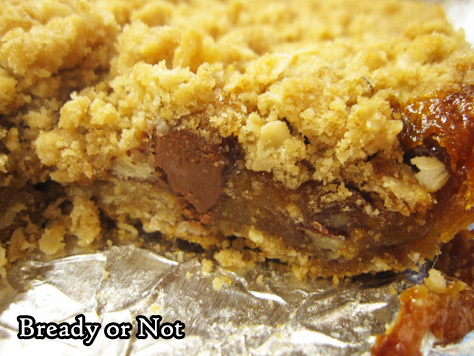 The recipe essentially makes a big, fat candy bar. 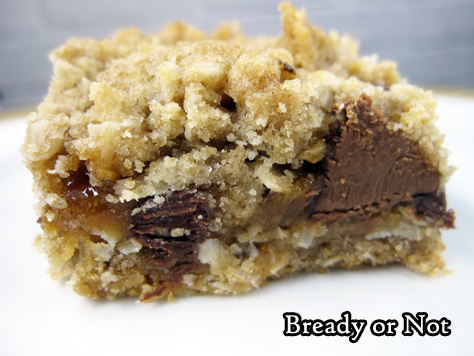 Oatmeal forms the crust, while the middle consists of chocolate chips and gooey caramel. Yeah. This isn’t a health recipe, but wow, is it good. This was worth being published again in 1999–and again now, with some new tweaks. 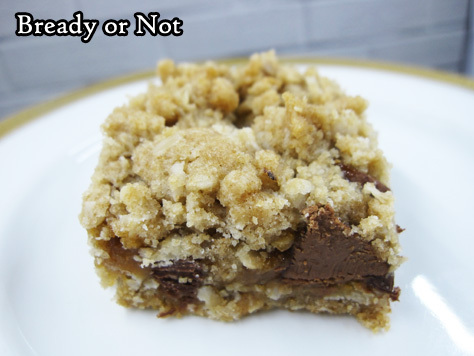 These bars are like big, delicious candy bars loaded with oats, chocolate, and caramel! Note that they should be well-chilled before slicing into bars and will be more cohesive if stored in the fridge as well. Modified from magazine Best From 50 Years of Bake-Off, May 1999. 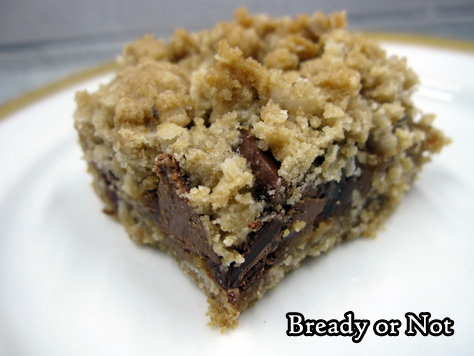 In a large bowl, combine all crust ingredients until crumbly. Reserve half, about 3 cups, for the topping, and press the rest into the bottom of the pan. Bake for 10 minutes. Meanwhile, in a medium bowl, stir together the caramel and 4 Tablespoons of flour. When the crust is done baking, sprinkle chocolate chips and pecans over the top, then drizzle evenly with the caramel mixture. 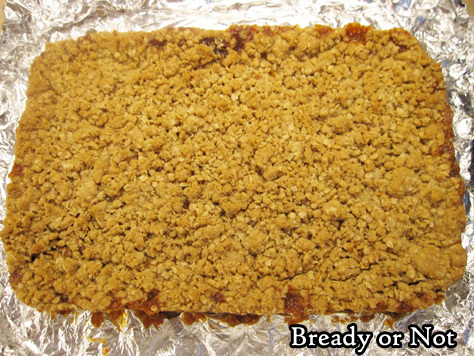 Add the reserved crumb mixture on top. Return to the oven for about 20 minutes, or until golden brown. Cool for an hour or so, then set in fridge to completely chill for several hours or overnight. To cut, use the foil to lift contents to a cutting board. Slice into bars. Store in sealed container in fridge with layers between pieces of parchment or wax paper. Bars will stay more cohesive if chilled; they are gooier at room temperature.